The Nation: Catholic Health Association Flip-Flops The Catholic Health Association, previously a supporter of the Affordable Care Act, has announced it now opposes the law. The Nation's Emily Douglas says its both an affront to women's rights and the health of the population. 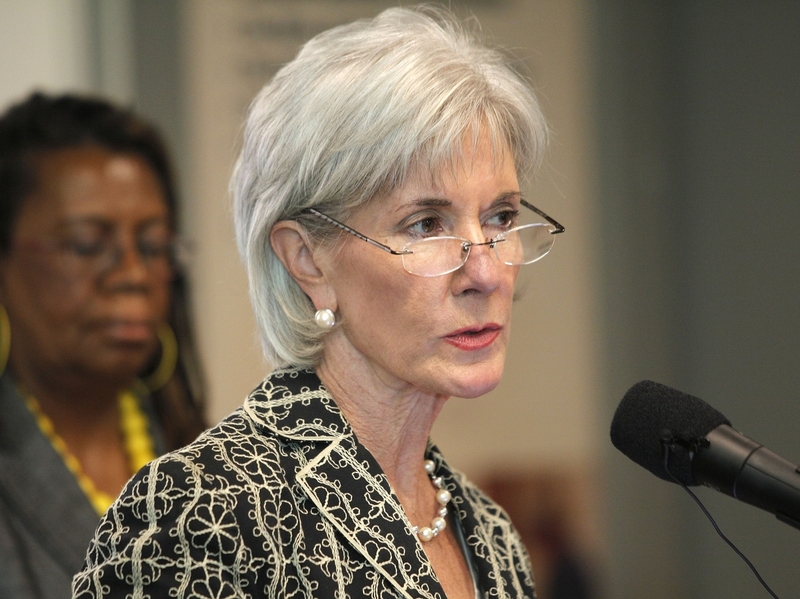 Secretary of the U.S. Department of Health and Human Services Kathleen Sebelius speaks about the Affordable Care Act at Covenant Community Care health center June 20 in Detroit, Mich. The law and her department have come under heavy criticism for a mandate that would require insurance companies of religious organizations to cover contraceptives. Emily Douglas is a senior editor at TheNation.com. From the Department of I Was Worried Enough About Obamacare Already, Thanks: the Catholic Health Association, a key ally of the Obama administration in passing the Affordable Care Act, has changed its mind about supporting the compromise on birth control coverage. That was the "miraculous" accommodation that ensured no-cost contraceptive coverage to employees of religiously affiliated organizations, while making insurers, rather than the religious employers, responsible for picking up the tab. When the compromise was offered in February, CHA gave initial support. But CHA has now sent a letter to the Department of Health and Human Services opposing the compromise. I wouldn't say as much as we withdrew support. What we said very clearly was that it is just too cumbersome. And I'll tell you why. Many, many, many of our organizations offer a choice in health coverage to their staffs. So they would have two different ways of dealing with their employees on this issue and, quite frankly, many of our members were hearing from local insurance companies and agents that 'well, we may not carve out explicitly how we're charging you for this but there is no free lunch and you are going to pay for it one way or the other.' That was exactly what the goal was not. The goal was to not pay. And that's not the fault of the White House. That's the reality of the marketplace. Here's another reality of the marketplace: religious hospitals, like non-religious hospitals, rely on public funding for about half their operating revenues. Despite the religious affiliation, reports MergerWatch, "little or none of the operating funds of these religious hospitals come from churches or other religious sources." The reach of sectarian hospitals is vast: MergerWatch found that in 1999, religiously affiliated hospitals were operating one in every five acute care community hospital beds in the United States. And while Catholic hospitals may have been founded to cater to the spiritual needs of Catholics, by 2012 religiously affiliated hospitals are deeply embedded in diverse communities and in insurance plans. "This complaint is a red herring," says Sharon Levin, Director of Federal Reproductive Health Policy at the National Women's Law Center. "Women have a right under this law to needed healthcare, including contraception. How to avoid doing that should not be the focus." CHA's letter makes clear the pitfalls of pandering to "religious freedom" concerns in setting public policy. "If an institution chooses to participate in secular activities, and hires people who are not co-religionists, they should be held to the same standard as other employers," says Levin. "Religion not a license to discriminate." At issue is not only contraceptive coverage. CHA is also concerned about what institutions count as "religious"—a designation that has ramifications that reach far beyond the birth control issue. While Obama's compromise required hospitals, schools, and social service agencies with religious affiliations to provide contraceptive coverage, it exempted houses of worship as "religious institutions." According to its letter to HHS, CHA would like to see an institution considered "religious" "if it shares common religious bonds and convictions with the church." That's a stretch. "It is very important that the administration resist the request for a broader religious exemption that would cover entities that are not themselves religions but have vague 'bonds' to a religion or are motivated by faith," says Frances Kissling, former head of Catholics for Choice. "CHA claims that running hospitals is an integral part of living the teachings of Jesus. One can care for the sick and the impoverished in many ways besides controlling one-sixth of the hospital beds in the US."